Non-vacuum sanders, remote vacuum sander, ventri vacuum sander. Sioux Signature Series sanders. A very comfortable palm sander with an ergonomic, adjustable grip. This soft textured grip rotates and locks into 24 indexable positions to accommodate various hand sizes and shapes of right or left handed operators. The power lever is contoured to fit along the muscles at the base of your thumb. All of these sanders use the universal motor with dual vibration dampeners and one-piece precision machined counterbalance. You can disassemble, replace motor cartridge, and reassemble in under 2 minutes. Below are 5 of the 60 different available configurations. Please view our Additional Sioux palm sanders pdf for other disc sizes and orbit patterns. All are available for either PSA or hook & loop discs, with either of the 3 vacuum options. Internal threads on these sanders fit backing pads on the following pages: Hook and loop pads , PSA pads but the thicker foam pads on both of those pages should not be used on these 12,000 RPM sanders. For additional sanders, please see our DA, random orbital , Inline sander , Pistol grip sanders , and Right angle sanders pages. 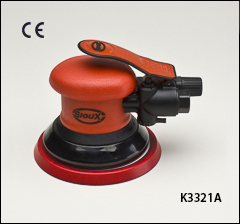 Sioux built-in speed control and ergonomic 24-position indexable grip. Dust is not self contained. Fine finish 3/32" orbit, or 3/16" standard orbit. 12,000 RPM, 0.25 HP. 5/16"-24 threads, 13 SCFM @ 90 PSI, 1/4" air inlet, 3/8" min. hose, 3" high, 1.5 lbs. 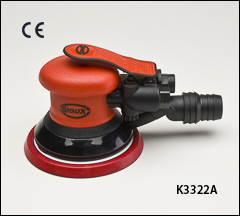 Sioux built-in speed control and ergonomic 24-position indexable grip. Tool includes a rotating fitting for 2 different vacuum hose sizes, and is ready for your in-house dust collection system. Includes PSA backing pad and wrench. 3/16" standard orbit is listed below. 5" sanders are also available with 3/32" fine finish orbit, or 3/8" coarse orbit. 12,000 RPM, 0.25 HP. 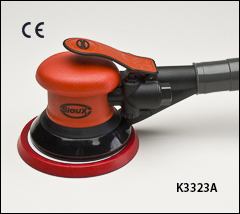 Sioux built-in speed control and ergonomic 24-position indexable grip. The Venturi vacuum system exhausts dust through hose and into bag. Dust hose and bag are shipped with the sander. Includes PSA backing pad and wrench. 3/16" standard orbit is listed below. 5" sanders are also available with 3/32" fine finish orbit, or 3/8" coarse orbit. 12,000 RPM, 0.25 HP.